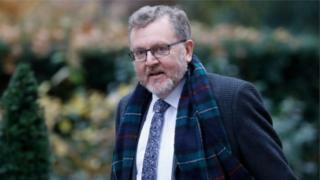 Scottish Secretary David Mundell has said coming out as gay was "one of the most difficult things I've done". Mr Mundell revealed in January 2016 that it was time to "acknowledge in public as well as in private, who I am". At the time, the father-of-three was believed to be the first openly-gay Conservative cabinet minister. Mr Mundell, 56, will host a reception in Edinburgh on Thursday to mark LGBT History Month. The MP for Dumfriesshire, Clydesdale and Tweeddale said: "Coming out was one of the most difficult things I have done, but also one of the most important. "I was overwhelmed by the support I received from friends, family and colleagues." He added: "Everyone should feel able to live their lives as they wish, in safety and confidence, without fear of judgment or discrimination. "We have come a huge way in better rights for our LGBT communities, and LGBT History Month is a valuable reminder of those hard-won achievements. "But we still have more to do to build a wholly inclusive and accepting society. This month I hope that, by reflecting on our collective history, we continue to pave the way for a fairer future." Mr Mundell's 2016 announcement took the number of openly-gay MPs in the House of Commons to 33 - one of the highest proportions of any parliament in the world, according to a study by US academics.